Once the composting worms are all settled in your vermicomposting worm bins, you may be wondering how soon you can benefit from all this setup. Afterall, you've prepared the worm bin bedding and supplied the composting worms lots of food. So they should be happy. It would typically take 3 to 4 months before you can harvest vermicompost from the feeding tray. Vermicompost is a mixture of vermicast and unprocessed organic matter. It may also contain worm capsules and small worms. Vermicast is the excreta of worms produced by the action of microbiological life within the digestive tract of the worms. Sometimes erroneously referred to as worm tea, vermicompost leachate is what drips or trickles down to the drain tray of your worm bin setup. This is mostly decaying waste water that came from the decomposing vegetable matter from the feeding trays. This is potentially rich in microbes that is still beneficial to the soil and to your garden plants. Occasionally inspect the inside of the drain tray by lifting up the feeding tray. Remember, the spacers are only 2 inches high and the vermicompost leachate needs to be removed before it reaches the 2-inch height. Otherwise, the leachate will reach the inside of the feeding tray and the composting worms will avoid the wet surroundings of the feeding tray. Collect the vermicompost leachate by pouring it into a container like the one below. 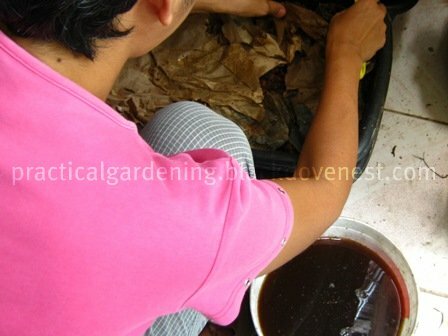 Vermicompost leachate may vary in color, although it usually has the color of different shades of tea. I use coco sawdust (browns) that absorbs some of the moisture in the feeding tray. The sawdust is reddish and that probably explains the reddish-brown color of the vermicompost leachate. Vermicompost leachate is ready to use on your plants. Using minimal amounts won't burn the plant roots. But to be economical, it's far better to dilute it using 1 part leachate to 4 parts water. There is less wastage of leachate this way. Here we pour diluted vermicompost leachate to the base of healthy eggplants. 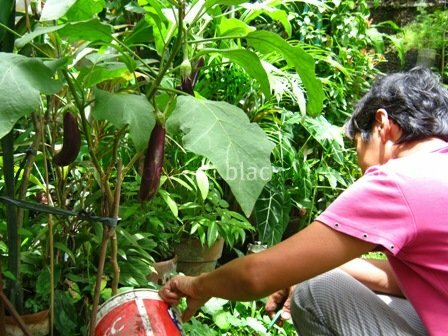 The eggplant fruits look bigger and fuller. After around 3 months, start inspecting the bottom feed tray. If there is very little or no more decaying vegetable matter, the vermicompost material is ready for harvesting. With home applications, this can be a simple manual process. Use a small handy garden rake like the one below to sort out the remaining compost worms and undecomposed vegetable matter. Pick these out and put them in the next feeding tray. Don't bother picking up worm eggs if you see them. These will hatch in your soil after you amend it with the vermicompost. 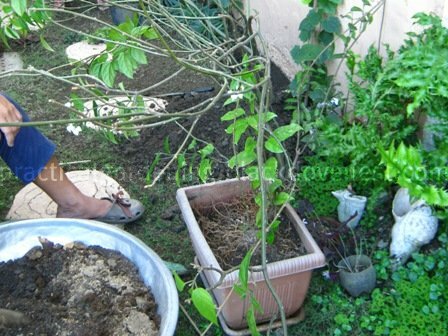 Vermicompost is a very good conditioner for any garden soil. We have clayey soil in our property and so when we replant or repot in our garden, we mix vermicompost with soil as shown below. 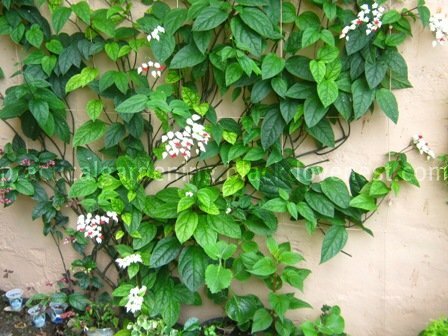 The plant above is a Bleeding Heart (Clerodendrum thomsoniae). 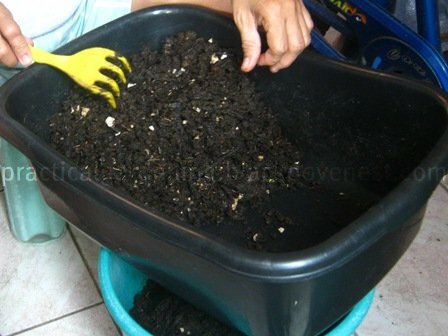 We typically add vermicompost as much as we can and the result is very healthy and robust plants. The Bleeding Heart that we transplanted from a pot to the garden ground recovered well, and was producing plenty of flowers after a few weeks. We noticed that seeds and seedlings that were planted on soil with vermicompost germinated and grew faster. 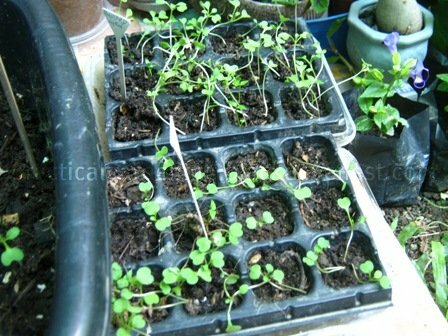 Here are a few seedlings we planted with vermicompost. 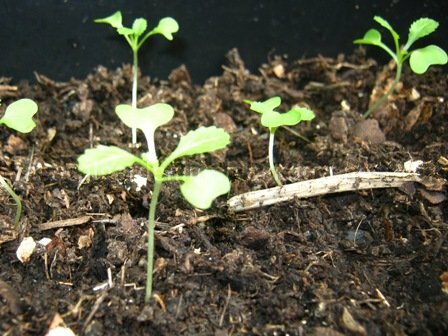 These are mustard seedlings that quickly grew and became healthy.